Session 1: Dr. Ben Lynch, ND: MTHFR and Clinical Neutrigenomics: Bridging Preventative Medicine and Individualized Medicine: Clinical neutrigenomics is where naturopathic and holistic medicine providers can bridge individualized medicine and preventative medicine. Understanding methylation defects is critical for restoring genetic, biochemical and physiologic function in order to achieve optimal health. In this presentation, Dr. Lynch will explain the clinical significance of nutrigenomics and methylation defects by reviewing pathways of folate metabolism, transmethylation adn transsulfuration. He will review common genetic polymorphisms along with their effects. Dr. Lynch will focus his lecture on the in-depth evaluation of methylation defects including proper history taking, genetic testing and laboratory analysis. Session 2: Dr. Paul Anderson, ND: Methylation and SNP Analysis: Clinical Implementation and Assessment: Methylation and SNP analysis can be both exceedingly helpful and clinically difficult to manage at the same time. 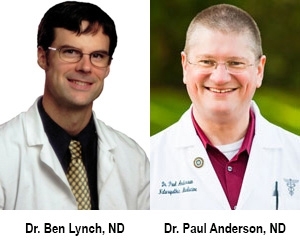 During the first half of the presentation, Dr. Anderson will review the clinical implications of MTHFR and related SNP's and will also give case examples of each SNP. During the second half of the presentation, Dr. Anderson will focus on the management of MTHFR polymorphisms while focusing on the effects of such defects on each organ system. He will review his findings from clinical studies, present evidence based treatment plans and provide illuminating clinical cases that demonstrate how genetic polymorphisms can be managed with diet, lifestyle, detoxification and targeted nutritional supplementation. Thank God for Paul Anderson. I said it during board review class and I'll say it again now: his strength is conveying complex information in clarifying ways. So glad both of these guys are sharing their expertise in accessible ways. I've been hungry for this information for quite some time. Thanks! Dr. Anderson has a true gift at taking something difficult and breaking it down into a language that anyone can understand. His down-to-earth nature and wit are really appreciated! His folksy good humor in presenting extremely complex information in a very accessible way that was related both to his study and direct clinical experience. Dr. A has a beautiful way of making things simple and easy to understand! Fantastic presentation!! Loved his "helpful recommendations" ie: niacin dosing to bring someone out of a flare. Found his presentation very useful and enjoyed it! Very complete! Far better than I expected! Ben is clearly brilliant and knows a lot about this topic! Fantastic and very applicable content. Great overall information on MTHFR and related pathways. Well-referenced. Really great understanding and explanation of the chemistry which helps so much in teaching clients.